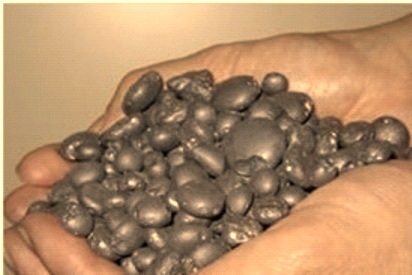 The process of production of iron nuggets is capable of directly producing solid, high density, highly metalized iron nuggets from dry green balls. These green balls are made out of iron ore fines, pulverized coal, fluxes and binders. The pulverized coal is reductant which is added to the system to supply the carbon required for the reduction and carburization. Binder (bentonite) in conjunction with the finely ground iron ore particles serves to improve the properties of green balls in wet and dried conditions. The flux is limestone, which fluidizes the slag and also prevents excessive iron losses in the slag. The iron nuggets are produced using a direct reduction process. The reduction process is carried out in a rotary hearth furnace, using coal as the reductant and energy source. The direct reduction of iron by this process is more energy efficient and more environmentally friendly than traditional iron making processes. Iron nuggets are an ideal feed material for steelmaking and iron casting. This material consists of essentially all iron and carbon, with practically no gangue (slag) and low levels of metal residuals. Fig 1 shows sample of iron nuggets. Iron nuggets are a premium grade iron product with superior shipping and handling characteristics. They can be shipped in bulk either inland in railway wagons or trucks or in the ocean going vessels. Iron nuggets can be stored outside with no special precautions. They can be handled as a bulk commodity using conventional magnets, conveyors, bucket loaders, clams, and shovels. The physical properties of iron nuggets are as follows. The chemical properties of iron nuggets are as follows. In the process of manufacture of iron nuggets, all the iron oxide is reduced and no FeO remains in the nugget. The process produces slag free iron nuggets. The contents of silicon, manganese and phosphorus in the product depend on the nature and the chemical analysis of the raw materials used for the process. The product sulfur level also depends on the sulphur contained in the feed reductant. However, it is often possible to reduce the sulphur level remaining in the nugget to an acceptable range. The final nugget product does not re-oxidize and does not require special handling during shipment. The microstructure of iron nuggets consists of the phases of ? ferrite, iron carbide, and iron sulphide. The micro constituents present in the microstructure are eutectic cementite, pearlite, and iron carbide. The microstructure is similar to the microstructure of low carbon, low silicon white cast iron which is essentially the same as that of pig iron from a blast furnace. The following are the features of iron nuggets. They have a carbon content of 2 % t0 3 % which is advantageous for electric steel making. They are clean iron with no impurities such as copper and nickel, which adversely affect the steelmaking process. Iron nuggets provide a feedstock for steelmaking with consistent chemistry and physical characteristics. They have high specific gravity. Iron nuggets have superior melting performance than blast furnace pig iron since they have low melting point and higher thermal conductivity. They are of appropriate size for charging continuously into steelmaking furnaces. Iron nuggets can reduce charging time, increase steel melting shop productivity, and reduce energy consumption. The size of iron nuggets helps in easy transportation and handling. Iron nuggets do not generate fines during handling. Unlike other direct reduced iron and hot briquette iron (HBI), the iron is completely reduced. Unlike other direct reduced irons, iron nuggets do not reoxidized and ignite a fire. Unlike other direct reduced irons and hot briquette iron (HBI), it does not contain a gangue constituent.